Troparion (Tone 3): Let the heavens be glad, * let the earth rejoice, * for the Lord has done a mighty deed with His arm. * He trampled death by death. He became the first-born of the dead; * He saved us from the abyss of Hades * and granted great mercy to the world. 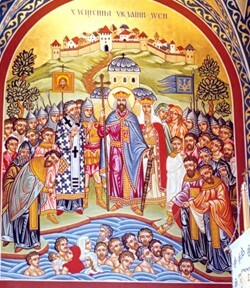 Troparion (Tone 4): O you, who glorified Christ: * princes and bishops, * monastics and martyrs, * and steadfast confessors of Christian Ukraine throughout all times, * pray Christ God to look with favour on our people * and to grant them the grace to persevere in the faith * that the souls of prayerful faithful * who revere your sacred memory * may be saved. 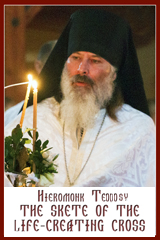 Kontakion (Tone 3): You rose from the tomb, O compassionate Lord, * and led us out from the gates of death. * Today Adam exults and Eve rejoices, * and the prophets together with the patriarchs unceasingly acclaim the divine might of your power. 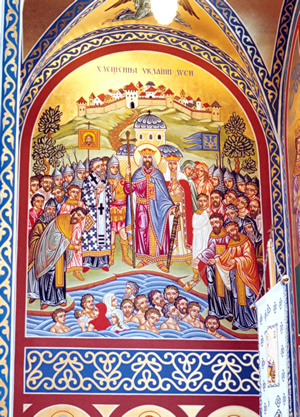 Kontakion (Tone 4): You shine as bright beacons, * O God-inspired and righteous saints of our Church. * By your encouraging example * you serve communities of faithful throughout the Christian world. * Therefore we humbly bow our heads to you * thanking our great and all-gracious God, * Who has made you our intercessors in heaven, * where you pray for our souls. Prokimenon (Tone 3): Sing to our God, sing; sing to our King, sing (Ps 46:7). Prokimenon (Tone 7): Precious in the sight of the Lord is the death of His venerable ones (Ps 115:6). Epistle: (Romans 6:18-23) (Sunday): Brethren, freed from sin, you have become slaves of righteousness. I am speaking in human terms because of the weakness of your nature. For just as you presented the parts of your bodies as slaves to impurity and to lawlessness for lawless ness, so now present them as slaves to righteousness for sanctification. For when you were slaves of sin, you were free from righteousness. But what profit did you get then from the things of which you are now ashamed? For the end of those things is death. But now that you have been freed from sin and have become slaves of God, the benefit that you have leads to sanctification, and its end is eternal life. For the wages of sin is death, but the gift of God is eternal life in Christ Jesus our Lord. Epistle: (Romans 8:28-39) (All Saints of Rus’ Ukraine): Brethren, we know that all things work for good for those who love God, who are called according to his purpose. For those he foreknew he also predestined to be conformed to the image of his Son, so that he might be the firstborn among many brothers. And those he predestined he also called; and those he called he also justified; and those he justified he also glorified. What then shall we say to this? If God is for us, who can be against us? He who did not spare his own Son but handed him over for us all, how will he not also give us everything else along with him? Who will bring a charge against God’s chosen ones? It is God who acquits us. Who will condemn? It is Christ (Jesus) who died, rather, was raised, who also is at the right hand of God, who indeed intercedes for us. What will separate us from the love of Christ? Will anguish, or distress, or persecution, or famine, or nakedness, or peril, or the sword? As it is written: “For your sake we are being slain all the day; we are looked upon as sheep to be slaughtered.” No, in all these things we conquer overwhelmingly through him who loved us. For I am convinced that neither death, nor life, nor angels, nor principalities, nor present things, nor future things, nor powers, nor height, nor depth, nor any other creature will be able to separate us from the love of God in Christ Jesus our Lord. Alleluia (Tone 3): Alleluia, alleluia, alleluia! 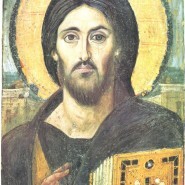 verse: In You, O Lord, have I hoped that I may not be put to shame for ever (Ps 30:2). verse: Be a protector unto me, O God, and a house of refuge to save me (Ps 30:3). Gospel: (Matthew 8:5-13) (Sunday): At that time, when Jesus entered Capernaum, a centurion approached him and appealed to him, saying, “Lord, my servant is lying at home paralyzed, suffering dreadfully.” He said to him, “I will come and cure him.” The centurion said in reply, “Lord, I am not worthy to have you enter under my roof; only say the word and my servant will be healed. For I too am a person subject to authority, with soldiers subject to me. And I say to one, ‘Go,’ and he goes; and to another, ‘Come here,’ and he comes; and to my slave, ‘Do this,’ and he does it.” When Jesus heard this, he was amazed and said to those following him, “Amen, I say to you, in no one in Israel have I found such faith. I say to you, many will come from the east and the west, and will recline with Abraham, Isaac, and Jacob at the banquet in the kingdom of heaven, but the children of the kingdom will be driven out into the outer darkness, where there will be wailing and grinding of teeth.” And Jesus said to the centurion, “You may go; as you have believed, let it be done for you.” And at that very hour (his) servant was healed. Gospel: (Matthew 5:1-16) (Saints): At that time Jesus went up the mountain, and after he had sat down, his disciples came to him. He began to teach them, saying: “Blessed are the poor in spirit, for theirs is the kingdom of heaven. Blessed are they who mourn, for they will be comforted. Blessed are the meek, for they will inherit the land. Blessed are they who hunger and thirst for righteousness, for they will be satisfied. Blessed are the merciful, for they will be shown mercy. Blessed are the clean of heart, for they will see God. Blessed are the peacemakers, for they will be called children of God. Blessed are they who are persecuted for the sake of righteousness, for theirs is the kingdom of heaven. Blessed are you when they insult you and persecute you and utter every kind of evil against you (falsely) because of me. Rejoice and be glad, for your reward will be great in heaven. Thus they persecuted the prophets who were before you. “You are the salt of the earth. But if salt loses its taste, with what can it be seasoned? It is no longer good for anything but to be thrown out and trampled underfoot. You are the light of the world. A city set on a mountain cannot be hidden. Nor do they light a lamp and then put it under a bushel basket; it is set on a lampstand, where it gives light to all in the house. Just so, your light must shine before others, that they may see your good deeds and glorify your heavenly Father.